I was thinking today that I've been good about not binging with a polish purchase lately. I'm not sure why that is, maybe I haven't seen a collection that has captured my attention. My wallet is happy about that and maybe now I catch up on using up some of my untrieds. Are you in a funk too? Or have you been enamored by any new releases? Have you ever been confused by a color, and unable to describe it accurately? 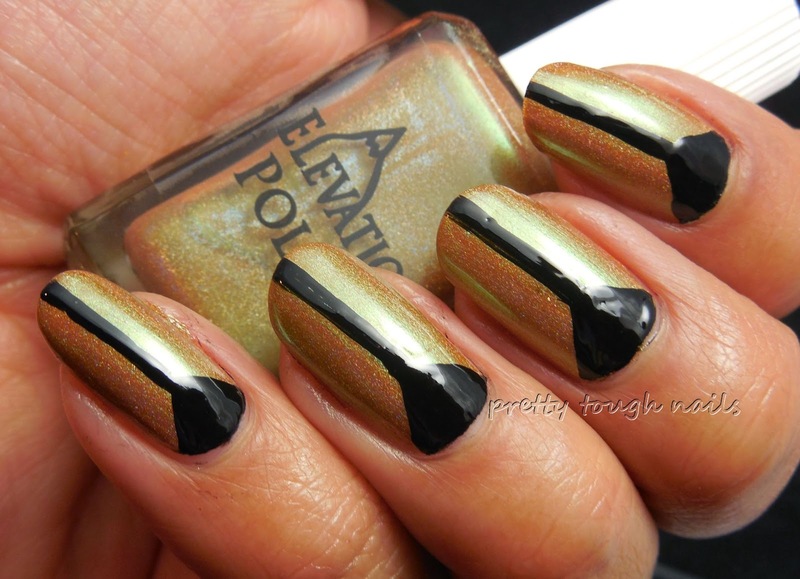 I'm having that problem with today's color, which is Elevation Polish Gobi, a gold base with green shimmer. I think there might be some holographic particles in there as well but the little guys aren't really translating onto the nail. For being a light color, I expected the formula to be sheer but instead it applied with plenty of pigmentation and needed only two coats here. There's a bit of brush strokage as well, so make sure to wipe the excess polish on the neck of the bottle before applying. No topcoat shown below. The green shimmer reminded me of beetle wings, and I was inspired to try and do a little geometric nail art to replicate a beetle's back. I used Wet N Wild Black Creme with a striper brush and then layered with my Poshe/GFC topcoat mix. Thankfully there was no streaking of the black! The green shimmer is much more prominent IRL than here in these pics, and the beetle effect really works with this base color. Elevation always makes really unique colors, and this is certainly one of them. I think the spectraflair adds a touch of elusive sparkle that really sets this color apart from anything else I've ever seen. Have you ever encountered an intriguing polish that crosses line the line between shimmer and holo? This is an interesting color! It's very unique, at least to me. I really like the nail art you did on top. By the way, I just found out that Hit Polish is coming back into business on May 15th! Rachel will be releasing new polishes along with old creations. I'm definitely going to have to check it out. As for other polish purchases, blog sales are getting the best of me lately. Wow cool! So glad to hear that she's making a comeback. I still haven't been tempted by anything lately, but then again I haven't been keeping up with reading my blogs. I need to catch up on those new collections!